The other day my brother and some friends saw for KING & COUNTRY live at the Sydney Opera House. It was an extremely fun experience, and something I will treasure for the rest of my life. The duo of brothers Joel and Luke Smallbone worked so well together as singers and as musicians- and it made me think about whether siblings in a band last the distance or not. Well I guess in short…they do! Because over the past few decades, many sibling bands have formed- some have split up and some have kept going. Castro, comprised of Jason, Michael and Jackie Castro. For KING & COUNTRY, as aforementioned above. Former band BarlowGirl, with Alyssa, Becca and Lauren Barlow taking the reins on the lead vocals, guitars and drums respectively. Rockers needtobreathe are fronted by Bear and Bo Rinehart, while Switchfoot is led by Jon Foreman, and his brother Tim is also in the band. Mainstream country band The Band Perry is made up of siblings Kimberly, Reid and Neil Perry, while OBB features Zach, Jacob and Nich Oswald. And Cimorelli has six sisters- Christina, Katherine, Lisa, Amy, Lauren and Dani Cimorelli. Last year we are introduced to Bonray (who consist of siblings Zac, Jesse, Jake and Morgan Bonner); and in my previous reviews (for their single “Inside Out” and for their self titled Provident Label Group debut EP), I mentioned that one of the upsides to being in a sibling band is that ‘…the members share a closeness and a bond that other bands don’t have, and that’s what probably makes sibling bands stay together longer than other bands…’. And relating that to Bonray, we can hear from their music, that they’re a band who’s on fire for Jesus, and their passion is so infectious that I can’t help but dance and move my feet. The quartet have released an underwhelming EP, yet followed it up with a stellar pop single in “Inside Out”, so how does “love u forever”, which just released this past week, compare? The answer, unfortunately, is that this song is quite repetitive, with the EDM elements not working at all. It’s a shame, cause the siblings are crazily talented, however cliché lyrics and a chorus that we’ve all heard before (Seriously- the line ‘I love u forever’ as the chorus over and over is…overkill! ), means that this is a step back. Zac, Jesse, Jake and Morgan have the ability to turn it around though, and have the ability to write a well thought out and inspiring song- but for me “love u forever” isn’t it, and probably will never be. 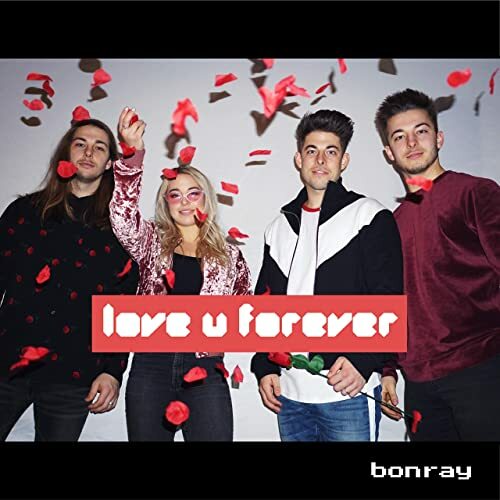 A pre-cursor to probably a full-length debut from Bonray this year sometime (although I did say that last year, which never eventuated, “love u forever” is well meaning, is catchy, but isn’t long lasting. Sure, it’ll bring radio airplay and new heights for the band- but if you’re looking for substance. I recommend “Inside Out” over this track any day of the week! With the quartet extremely busy from touring and writing in the studio; I reckon an album is coming in the near future! But until then, you can listen to this song again if it grabbed your attention. I won’t though, and I’ll be putting “Inside Out” on repeat instead. To each their own favourites then- and until next time, let us overall marvel at how young these guys are yet how accomplished Bonray is as a band- singing-wise and songwriting-wise.